Toyota has released pictures of the production-ready Camry, which will go on sale in early 2019. Set to rival the Ford Mondeo and Skoda Superb, the replacement for the Avensis will be powered by a 2.5-litre petrol engine paired with an electric motor and is likely to cost from around £30,000. Although exact UK specifications are yet to be released, the Camry will only be available with the hybrid powertrain in Europe. It produces 218PS and 221Nm of torque, while CO2 emissions are rated at 98g/km and advertised fuel economy 67.3mpg. The petrol-electric setup is already used in the Toyota RAV4 hybrid. It'll take the Camry to 62mph in 8.3 seconds and a top speed of 112mph. With a low centre of gravity, Toyota's claiming an engaging drive combined with a class-leading ride quality. Slightly longer than the Skoda Superb and Ford Mondeo, the Camry promises lots of space inside. It takes a luxurious approach, says Toyota, with high quality materials including a choice of wood or satin chrome and fabric or leather. Three digital displays - dubbed the Human Machine Interface - include a 10-inch colour head-up display and a seven-inch display in the instrument cluster. An eight-inch central infotainment display features Toyota's Touch 2 multimedia system. The rear seats are available in two different designs: 60:40 split folding seats, or 40:20:40 power reclining seats with wide headrests and a large rear seat centre armrest. With the rear seats left up, the boot offers 524 litres of luggage space. The new Camry will feature Toyota's Safety Sense active safety features as standard. The range of initialisms include Pre-Collision Safety (PCS) with a Pedestrian Detection function, Adaptive Cruise Control (ACC), Lane Departure Alert (LDA) with steering assist and Automatic High Beam (AHB). 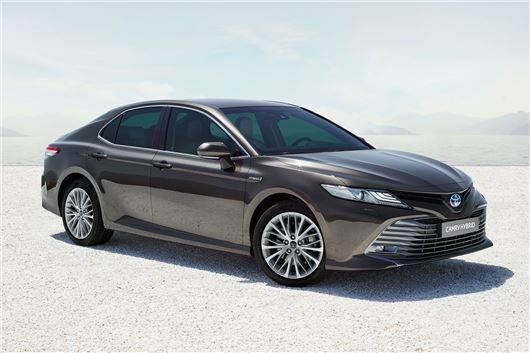 Toyota hasn't provided any forecasted sales figures for its Camry, but it'll be hoping it'll be more successful than the slow-selling Avensis which it's replacing. Unlike the Avensis, the Camry's been a world-wide success for the brand - with 700,000 sold globally each year, making it the world's best-selling saloon car.